GUACIMARA - Spectacular views, private heated pool, sauna, natural beach, relax. 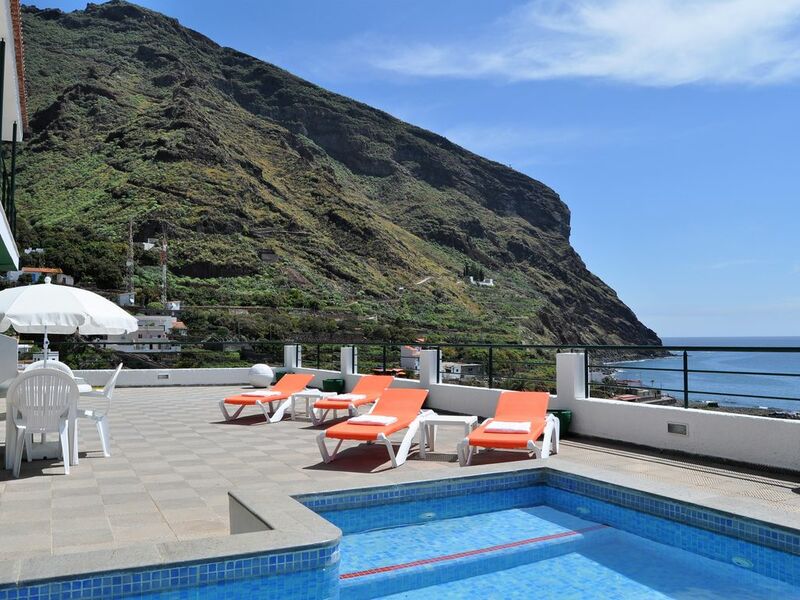 The house is located near the sea in the agricultural and fishing village of Igueste de San Andres, Tenerife. Situated on the slopes of a valley of the Anaga Massif natural park, the village is all pedestrianised with one access road. The house is secluded and tranquil with only the noise of the sea and birds. Large hall and reception room with access to a long terrace which spans the house and communicates with the master bedroom. The terrace on two sides of the house affords excellent views of the sea, valley and mountains. The kitchen is fully equipped. The master bedroom has an en suite bathroom. There are two other bedrooms and a family bathroom. The lower floor comprises: a large sun terrace with great views of the sea, valley and mountains, two heated pools, one 50 cm deep for children and the other for adults, a kitchen with built in bar, Finnish Sauna for 6 people and a bathroom. The house did not disappoint. Location of the property was superb and the views spectacular. Very tranquil. The 100 or so steps to and from the property made for a good workout for us 60 somethings. Well equipped kitchen, comfortable beds (very important). Loli was very helpful without being intrusive. Good communication via text/whatsapp/phone. Muchas gracias por vuestra estancia en GUACIMARA, ha sido un placer tenerlos como huéspedes y me agrada saber que les agradaron nuestras recomendaciones. Saludos Loli Delgado. We had a lovely 10 days here with our grandchildren, everything provided and lots of space. The sea views are amazing, a lovely tranquil area and only 10 minutes from Las Teresitas and restaurants in San Andres. The owner was very helpful and gave us good tips. Muchas gracias John, ha sido un placer tenerlos como huéspedes, nos gusta mucho que hayan tenido una estancia agradable y estaremos encantados de volverlos a tener en nuestra casa, saludos cordiales, Loli Delgado. Wonderful house with splendid sea view situated in a small charming village with friendly people and no tourists. We thank our landlord for being very kind and eager to make our stay as pleasant as possible. We enjoyed our stay a 100 percent. Poul Schjørring and family (two children being 9 and 7 years old), Copenhagen. Thank you for choosing Guacimara to spend your holidays, it was a pleasure having you, we hope to see you again!! Fantastic house with private pool and sauna. The house is very comfortabel. It was perfect clean when we arrived. The house is spacious and very well equioed. The owner Loli tought about everything to make our stay as comfortabel as possible. The house is positioned in a small village in a beautiful environment. There is a smal supermarket and a restaurant. The terasses and pool overlooking the sea are perfect. Close by there is a lovely beach with small restaurant. Muchas gracias por dejar vuestra opinión sobre la casa, ha sido un placer tenerlos como nuestros huéspedes y esperamos volverlos a ver en alguna otra ocasión. Saludos desde la cálida y agradable isla de Tenerife. Wunderbarer Meerblick und sehr gute Ausstattung (Kapselmaschine, Eiswürfelmaker, etc.) des Hauses machten den Urlaub zum Erlebnis. Die Stufen zum Haus runter sind kein Problem und wir hatten bei An- u. Abreise Hilfe. Die Vermieterin war immer erreichbar und kümmerte sich gut. Zu empfehlen ist auch das kleine Restsurant an der Straße. Wer Ruhe abseits der Touristenzentren haben will ist hier bestens aufgehoben. 3 Minuten zum Strand, der auch zu empfehlen ist. Hier ist surfen möglich. Wir waren 2 Erwachsene und drei Kinder. Ruhige Lage mit Meeresrauschen. Sehr zu empfehlen. Muchas gracias por dejar vuestro comentario, nos alegra mucho que disfrutaran de su estancia en la Casa Guacimara, espero volverlos a ver en otra ocasión, saludos cordiales, Loli Delgado. Das Landhaus Guacimara ist wunderbar gelegen. Vom Parkplatz am Dorfanfang erreichen wir über die Treppen das Landhaus mit freiem, fantastischem Blick zum Meer. Alles ist perfekt eingerichtet und lässt keine Wünsche offen. Der Ausgangsort für Wanderungen im Anaga National Park ist ideal. Nach einer langen Wanderung ist die Sauna und der kleine Pool auf der riesigen Sonnenterrasse perfekt zum Erholen. Essen auf dem Balkon und die Abendstimmung geniessen bis tief in die Nacht, ist genial. Die Begrüssung und Betreuung ist sehr angenehm und die Schlüsselübergabe unkompliziert. Vielen Dank an Loli und Familie für die herzliche Begrüssung und die Aufmerksamkeiten. Judith und Bruno aus der Schweiz. Gracias Bruno por dejar tu comentario. Ha sido un placer tenerlos en nuestra casa, me alegra mucho que hayan disfrutado de su estancia en la casa Guacimara y esperamos volverlos a tener con nosotros. Saludos desde el cálido y tranquilo valle de Igueste de San Andres! The village of Igueste de San Andrés is in a privileged location 14 km from Tenerife's capital, Santa Cruz. It has two black sand beaches ideal for surfing and fishing. You can access within the natural landscape of Anaga, the different trails.